I have not explicitly tackled a personal experience in my dance works before ‘Mothers’. When my first son was born and I was pregnant with my second son it was clear to me that nothing has quite had the same impact as having children. By the time the money for this project was raised, Liinus, my second born was almost 2. I was very interested in the confusing plethora of bodily fluids that are involved in the making, having and nurturing of a child. There was a clash and confusion between my body as a sexual one and my body as a nurturing one. This is where the big mushrooms were imagined. I wanted to have a messy element that is strange, has a connection to childhood, but is somewhat adult. 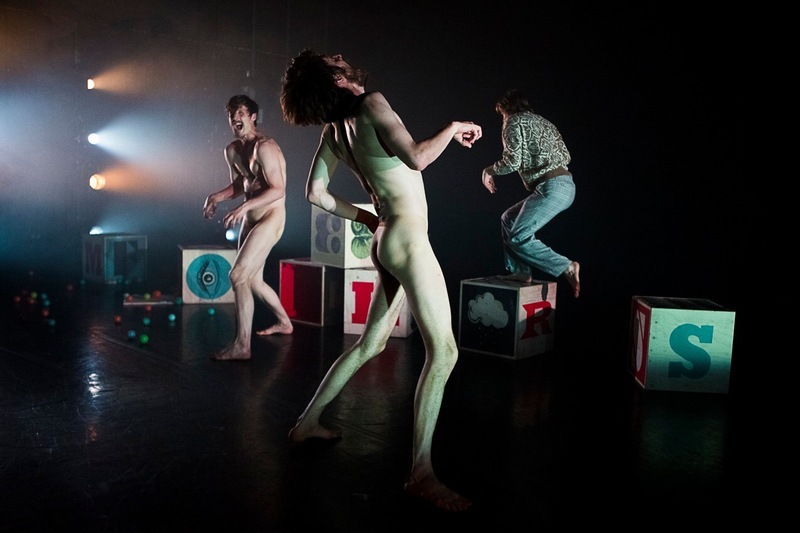 Hannah Clark, the designer I have worked with now for many years, went to design these fabulous, innocent looking, seeing, and pooing mushroom that were then worn in part of the show by my ‘co-mothers’ Neil Callaghan and Jake Ingram-Dodd. I myself starred as the uber-mother and I knew that I needed a trusted person on the ‘outside’ that can tell me what is there, sees potential and can tell me straight. Frank Bock as a mentor and dramaturg for this project was an obvious choice. He had been mentoring me in my choreographic work since I finished MA Choreography in 2003. What I didn’t quite expect was how fully he got invested in the project. He spent whole days with us in the studio being quite hands-on, making lots of suggestions, sharing his thoughts on ‘what is what’… here, when you are doing this, you are going into lyricism, here we are going into meaning, …here….into relationship. We were in very good hands, especially because his comments resonated with me and the learning that they brought to us three is huge. I especially remember a day later in the process where we were trying to figure out a journey through the show and the creative team was watching. My stress level was phenomenally high but whenever I looked over to Frank he had his attentive calm gaze resting on me, smiling and vigorously nodding his head as if to say: go on, it’s all going to be great. That’s supporting someone! Ever since I have nodded at people much more often. Making ‘Mothers’ was a massive journey for me from not having danced in years to being actually pretty fit, from being terrified by the prospect of performing to getting a total kick out of it, from being a mum with two young children to being a working mum. The show is not telling a story about motherly love, it has no narrative and is more a dream-like battle ground of overwhelm, fluids, and mayhem. There is lots of dancing- it’s an incredibly physical show and quite a ride to perform. When I find myself hiding behind some oversized block toys whilst the mushrooms wee in unison and help to get a poo out I know all that is left to do is to be drenched in water and slide around naked with my fellow mothers- done. Made it through another one. We are hoping to get ‘Mothers’ out of the box again in 2019. Can’t wait!